The mountains are our escape from the heat. We are fortunate that it’s only a 45 minute drive from the heat of the desert to cool, mountain fresh air. 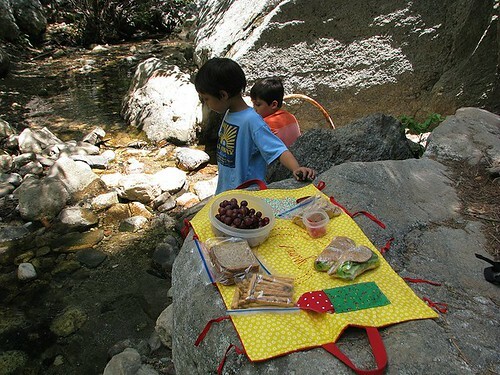 Today we decided to have a picnic using the picnic tote I made for this book a while back. You can see my page here. I used a vintage tea towel with some awesome forks on it. It folds in half and ties on the sides. Inside are two little pockets for utensils and a napkin. It turned out to be an nice little food tote. 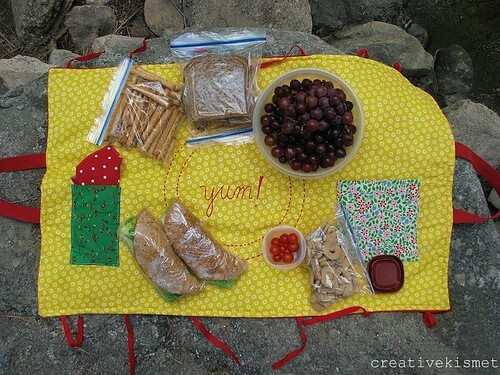 I see living room picnics in our future soon! This entry was posted in Family Life, Sewing and tagged picnic, tea towel, tea towel challenge book. Bookmark the permalink. I love that vintage tea towel! And the cheerful lining fabric is fabulous. I gotta get my hands on that book! 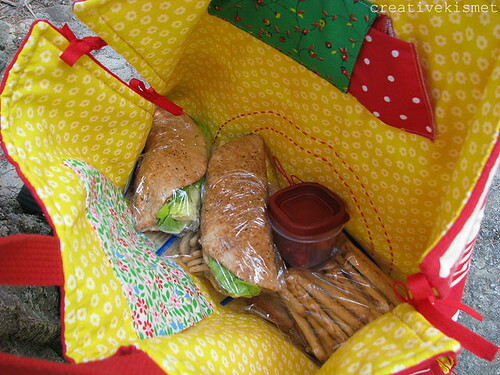 what a cute picnic tote! I love the colors & pattern from the tea towel. What a cool idea! 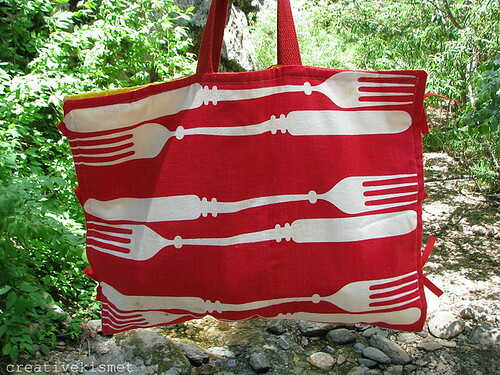 The fork design really adds to the nostalgic feel of going on a picnic. Wonderful! Your creativity is inspiring. Really puts to shame the Trader Joe’s bags we pack *our* picnics in. you always make the cutest things! love your talent. Adorable! And so handy for little day hikes, too. Thanks for the inspiration! 45 minute drive to escape the heat!?! Wow that sounds nice. It hasn’t gotten up to 100 here in Austin yet. So, I am still counting my blessings! I recognize those alphabet cookies….buy em all the time from Traders!!!! Those pretzels look familiar too! 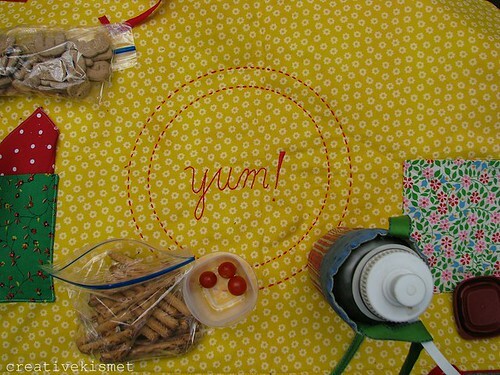 Luv the picnic tote, just can’t sew like you do. Happy Summer, we are settled in NH now and look forward to alot more blog reading! You look fantastic btw, the pear!